The Simpson-Bowles Deficit Commission will be reporting out its results in early December. We can expect that it will focus on domestic spending, especially entitlements, including Social Security. By the time the dust settles, it is quite likely that the Pentagon -- really the Military - Industrial - Congressional Complex -- will get a free ride for the reasons predicted by President Eisenhower in his farewell address. Given the short attention span of the mainstream media, we can expect the Commission's recommendations will be examined as if they are current news, devoid of historical context. But the question of context -- specifically, as it relates to how the spending behaviour of the US government managed to destabilize the improving trend in budget balances of the late 1990s (due in large part to the huge and growing surpluses of the Social Security Trust Fund in the 1990s as well as the effects of the economic expansion) -- is central to any rational determination of whether the enactment of Simpson-Bowles' recommendations will make things better or worse. Given the gravity of our economic situation, this kind of omission would simply compound the ongoing American Tragedy. I constructed Slide #1 using the budget numbers that were inside inside the Pentagon's computers at different times between April 2001 and February 2002. The the sum of the "yellow" and "blue" bars, for example, denotes the total as of Aug 2001, well before the attacks on the World Trade Center and the Pentagon. The "red" and “light blue” bars show the budget amounts we added after 9-11 and were in the computers as of February 2002. Bear in mind, the data in Slide 1 was never disputed by the senior budget officers from the DoD Comptroller's office (the organization that produced these numbers) who were among my "opposing" witnesses in the congressional hearing where I made this presentation (including the spectacularly inept Tina Jonas, who as the deputy under secretary of defense for financial management at the Department of Defense, was charged with reforming DoD's corrupt financial management system, as task at which she failed miserably). 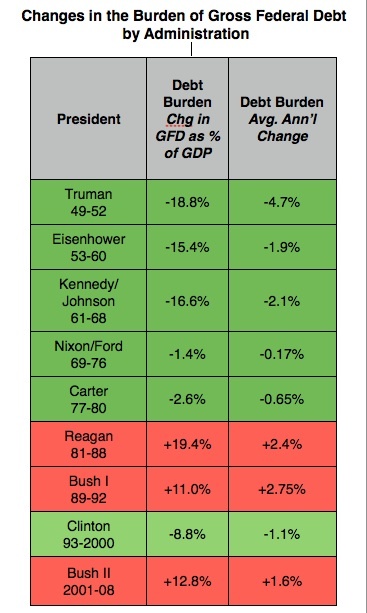 The impact of omitting the growth in the core defense budget that took place in the spring and summer of 2001 is important when trying to understand how we moved into our current deficit posture, not to mention any effort to fix the current mess in the Pentagon. That is because the deficit predictions attending Bush's tax cut plan were based on the long term effects of a nominal defense budget estimate made in his so-called "place holder" budget released, appropriately enough, on April Fools day of 2001 -- i.e., where the defense totals were portrayed by the "yellow" bars only. 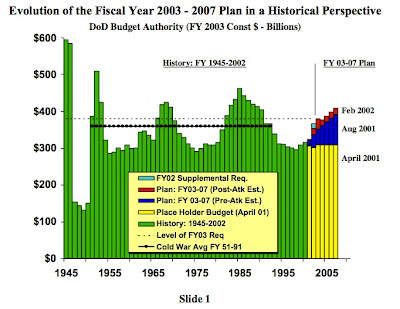 This nominal defense estimate assumed a constant dollar freeze in defense spending for the six years between Fiscal Years 2002 and 2007, as is clearly portrayed by the "yellow" bars in Slide 1. This long term defense "forecast" was a central part of the deliberately misleading effort to front load the Bush tax cuts by downplaying future consequences of those tax cuts with regard to the size and shape of the federal deficit. I can say this with certainty, because the detailed spending plans that were in the Pentagon's computers by August 2001 were based on budget guidance totals emanating from the Bush White House in late winter 2001. So, while Congress was debating the tax cuts in the context of a President's budget prediction that, among other things, the flat defense spending levels portrayed by the yellow bars in Slide #1, inside the Pentagon, we beavering away to increase those levels to the totals shown by "blue" bars in the core defense budget, an activity which was also authorized by the President. In addition to being a dishonest sleight of hand to sell the his tax cuts, Mad King George's flim flam operation in early 2001 fueled the long-standing, recklessly-destructive decision-making behaviour in the Pentagon summarized in our open letter to the Simpson-Bowles Commission, and discussed in more detail in my June 2002 statement to Congress, not to mention in my 1983 testimony to Senate Armed Services and Budget Committees, reported accurately in the 7 March 1983 issue of Time Magazine. But don't expect the mainstream media or the self-styled defense scholars, practitioners, and wannabees now rushing to demonstrate their relevance to deal aggressively with the corrupt financial management practices which are at the contextual core of the defense budget mess, as described in our open letter to the Simpson - Bowles commission. Question for Tea Partiers: Prior to 2008, Who Created the Most Government Debt? Obama inherited a federal deficit that was spinning out of control (mostly because of decreased tax take and increased expenditures for automatic stabilizers, e.g. unemployment insurance), and pressure is growing to cut Social Security (perhaps the most efficiently run program in government) while placing Defense (one of the most inefficiently run programs) off limits. These political pressures are not new and in fact have been building up for years. So, as a first cut into a complex issue, perhaps it is time for the angry masses to ask which political party put them into the fiscal straight jacket that is setting them up for this horrible choice?